While public funding for outdoor activities at school are cut, George Monbiot invites us to consider the benefit to children and society of more outdoor learning. Illegality, youth and belonging: Call for Papers open! The Call for Papers of the second symposium of the ‘Legal status, rights and belonging’ series is now out. Deadline is 15 July. The series overall investigates the relationship between immigration regimes, citizenship and politics of belonging and is jointly convened by Dr Roberto G. Gonzales at the Harvard University Graduate School of Education and myself at the new Institute for Research into Superdiversity (IRiS) at the University of Birmingham , in collaboration with Dr Elaine Chase, Jenny Allsopp and Vanessa Hughes at the University of Oxford. Scholarly literature shows that neoliberal globalisation, through delocalisation of state borders, precarisation of labour, restructuring of the welfare system, and the emergence of new non-state actors operating transnationally, have fractured the connections between state, territory and residents triggering a significant transformation in the meanings, practices and experiences of membership in contemporary Western democracies. The coexistence of different regimes of rights and the interplay of multi-layered systems of governance are a feature of contemporary societies. The multiplication of legal statuses for non-citizens is one of the manifestations of this transformation. However, little is known about the impact of the proliferation of legal statuses and precarisation of membership on the ‘members’ of these societies, and the ways in which legal status (or its absence) intersect with social cleavages such as age, class, gender and ‘race’ and shape social relations. Conceptions of state membership have been based on a notion of a bounded community whereby rules of legal citizenship determine community belonging and set the parameters for exclusion. More recently, however, a burgeoning line of scholarship is challenging the primacy of the nation-state for determining membership and endowing rights, arguing that recent trends in globalisation, human rights, and multiculturalism have made state borders less consequential. Focusing on non-citizens’ long-term presence and their status as persons, this scholarship argues that non-citizens create spaces of belonging that supersede legal citizenship. To be sure, both the older and the newer definitions raise critical questions as to when and how territorial presence constitutes membership. Collectively the symposia aim to break new ground through analyses that are empirically informed, theoretically engaged and ethnographically rich and drawing on the expertise of scholars from a range of disciplinary backgrounds and state contexts. As immigration has become a topic of great visibility among scholars, policy makers, and the media, this endeavour holds appeal to a range of audiences. The second symposium will explore the confusing and contradictory experiences of belonging and illegality that frame the everyday lives of undocumented immigrant youth. Although the protection of children is seen as a valence issue worldwide, national governments face the growing challenge of how to best provide for children’s well-being, given the political popularity of strong enforcement stances and stringent immigration policies against undocumented immigration. This tension has produced a broad range of state responses, with implications for local communities, services, and protections. Moreover, resulting from the uneven impact of the current global economic crisis, a new geography of migration is emerging, both in terms of new immigration destinations and of changing systems of governance of in- and out- flows of population. Little is known about whether and how social and political membership is changing in association with these processes. 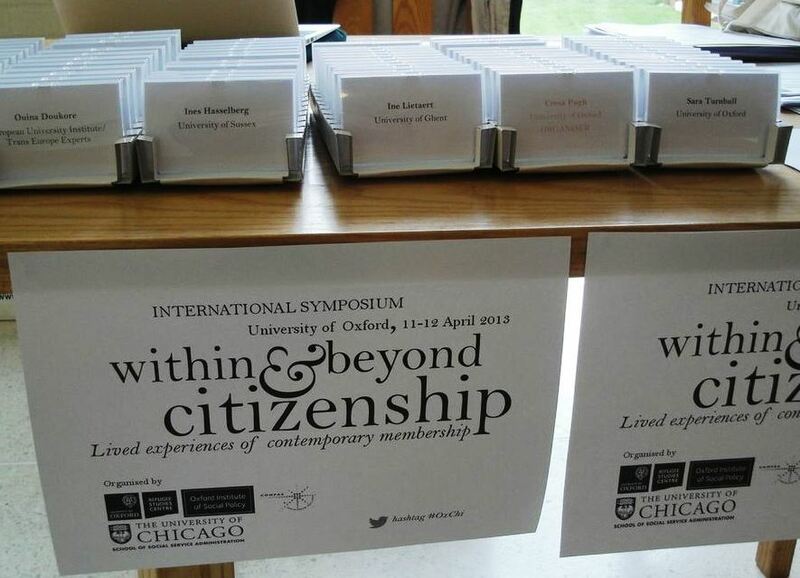 The first symposium held in Oxford focused on the interplay between forms and modes of contemporary membership, migration governance, and the politics of belonging. Participants discussed issues such as the position of the non-citizen in contemporary immigration and emigration states; the nexus between human mobility, immigration control, and citizenship; the tension in policy and practice between coexisting traditions and regimes of rights; the position of mixed status families in relation to the nation-state; and the intersection of ‘race’ and other social cleavages and legal status. The conference programme included four keynote talks by Nicholas De Genova, Roberto G Gonzales, Tanya Golash Boza and Nando Sigona, a roundtable and ten panels.